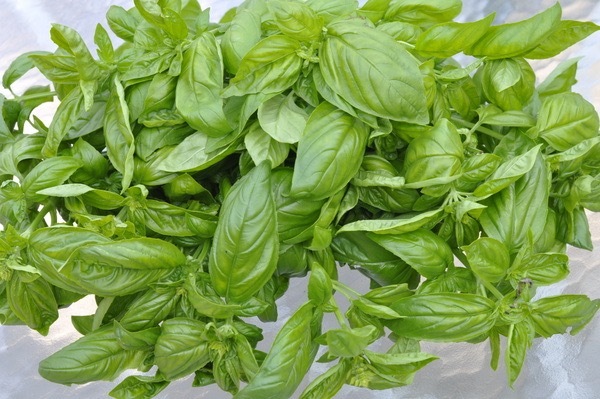 Is the basil in your garden reaching its peak, but the tomatoes nowhere near being ripe? Just when you’d like the basil to cozy up to those tomatoes in a salad bowl, these crops never mature at the same time. time to use with those tomatoes that will ripen in a few weeks. juncture above a pair of leaves. But what to do with the armful of basil you pick now when they’re aren’t fresh tomatoes for a salad? 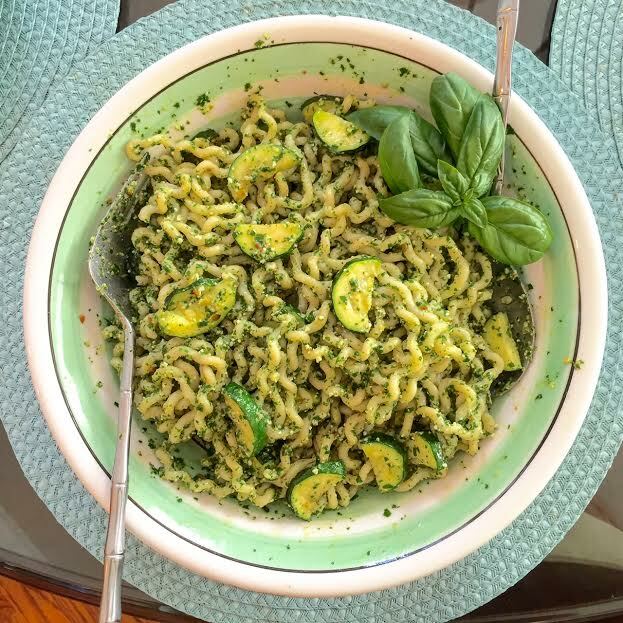 I’ve written posts on pesto before, including pesto with shrimp (click here), and a basic pesto primer (click here) that shows you how to make a real pesto alla Genovese, and how to keep your pesto a bright green color. home, I combined it with the pesto and served it over fusilli pasta. Not up for so much elbow grease? No problem. It’s a snap to make in a food processor. 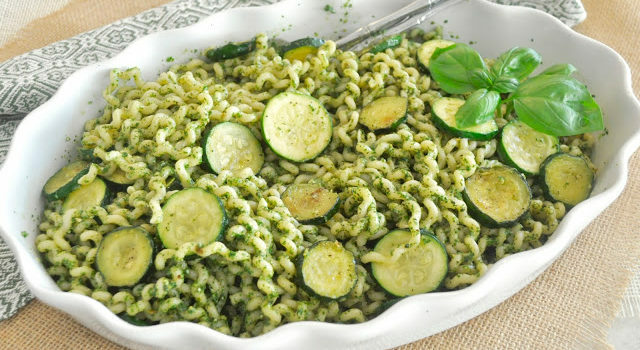 You can whir everything together, then start the pasta cooking while you sauté the zucchini. In the time it takes to boil the pasta, dinner can be on the table. Sauté the zucchini rounds in the olive oil, adding salt and pepper to season. Cook until softened, but not mushy. Start the water boiling for the pasta while you prepare the pesto sauce. falls off in a stream. Use your judgment. sauce when you’re mixing the pesto into the pasta. sauce. Serve with additional parmesan cheese, if desired. Here’s a tart that’s guaranteed to frustrate you. 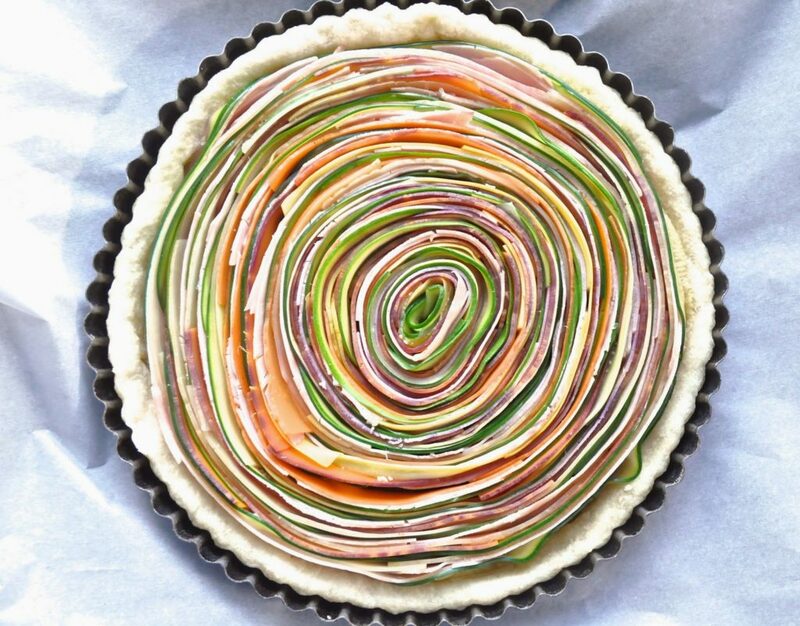 If you stay with it though, you’ll be rewarded with a tart that’s a visual stunner and tastes wonderful too. 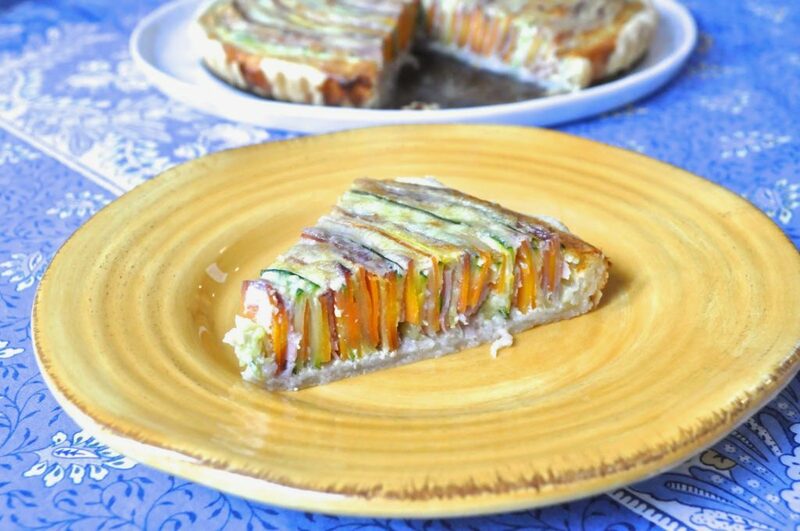 But don’t say I didn’t warn you when your pastry collapses, when you don’t have enough strips of veggies, or you run out of ham because you’re eating it instead of tucking it into the tart shell. Can you hear the swear words across the screen? Yea, just sayin’….. The first glitch came with the puff pastry called for in the recipe. It said to line a springform pan and prebake it for 10 minutes. Well, good luck with that, as the buttery dough decides to slide down the sides of the pan. Oh, I know what I’ll do. I’ll use a tart pan instead, and drape the dough over the sides, then trim the edges flush with the border. Nah, the puff pastry did its thing and “puffed” up almost to the top of the pan. And yes, I pricked the hell out of it before it went into the oven — to no avail. But I wasn’t going to let some bully of a puff pastry keep me from making this tart, darn it. So I moved to plan three and scratched the puff pastry idea, making a traditional tart pastry instead – and it worked. Take that, you ornery puff pastry! 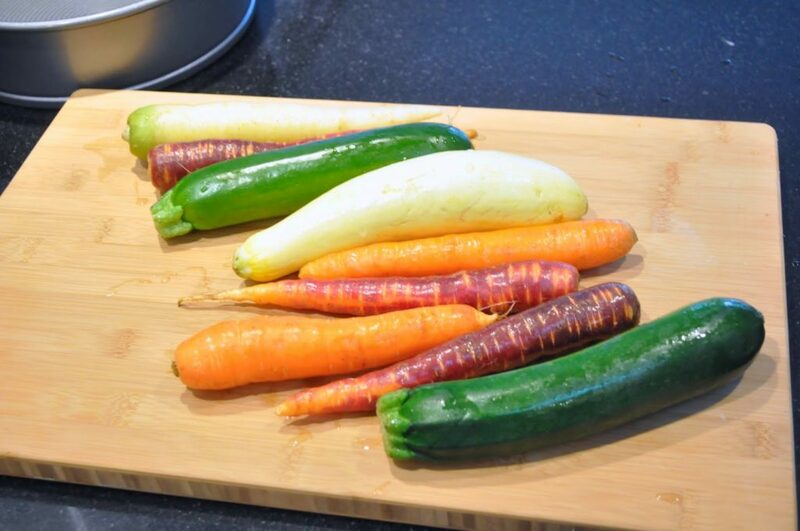 OK, so the next cast of characters are these veggies – green and yellow zucchini, orange, yellow and red rainbow carrots. You could try using a vegetable peeler to make the strips, but I used a mandoline instead. I didn’t want any accidents, so I stopped cutting when the pieces got too close to the blade. Don’t waste them though. They’re perfectly fine for cooking as a side dish some other time. You’ll need some ham for this too. I used a “French” ham that I find at my supermarket. It’s a very delicate flavor and the closest thing to prosciutto cotto I can find in the states. It’s also very delicious, which is why I couldn’t stop eating it out of hand, and ran out of it before I got to the end of the rolling. OK, so what you do first is parboil the veggie strips for a couple of minutes, let them cool, then start rolling, beginning with a strip of one of the veggies. Alternate with the ham and continue rolling. 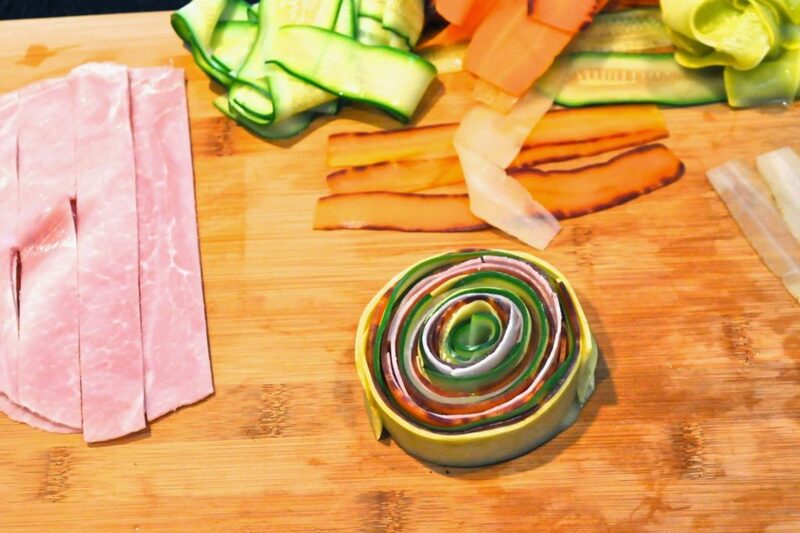 The parboiled strips of veggies will stick to each other, and so will the ham. This part is not hard, but time-consuming. 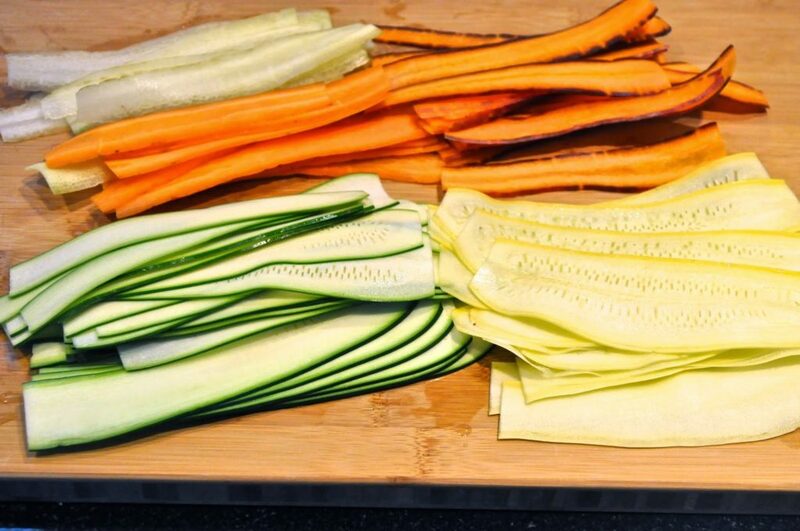 And I didn’t cut enough of the veggie strips and had to go back to the mandoline and cut more – and parboil more. The recipe called for a 6 inch diameter pan, but I thought that was too small to serve a group of people, so I used an 8-inch pan instead. It seemed as though I’d never get the spiral large enough, but I did – finally! 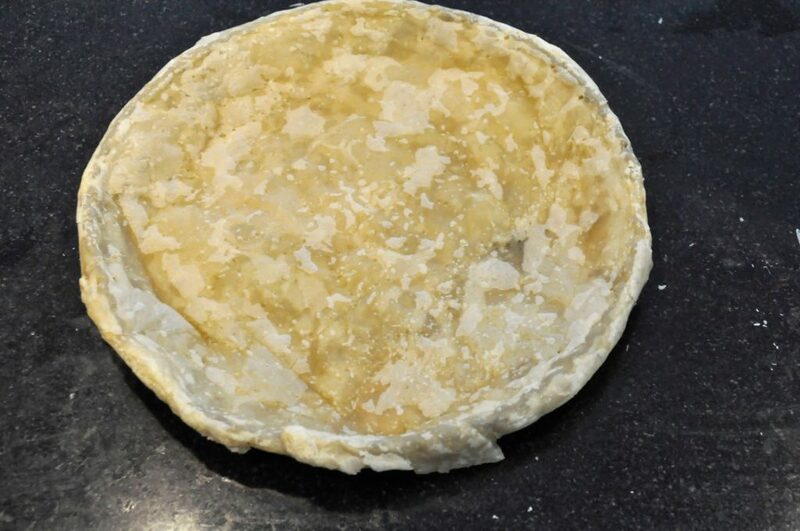 The next hurdle was transferring the spiral to the (pre-baked) tart shell. I used my hands and a large spatula, and while it was a little tricky, with some of the spiral getting dislodged, in the end I managed to put everything back in place and no one was the wiser. This part is easy – pour the filling over the top and spread in between the cracks. If you roll your spiral a little looser than mine, you’ll have more space for the filling. 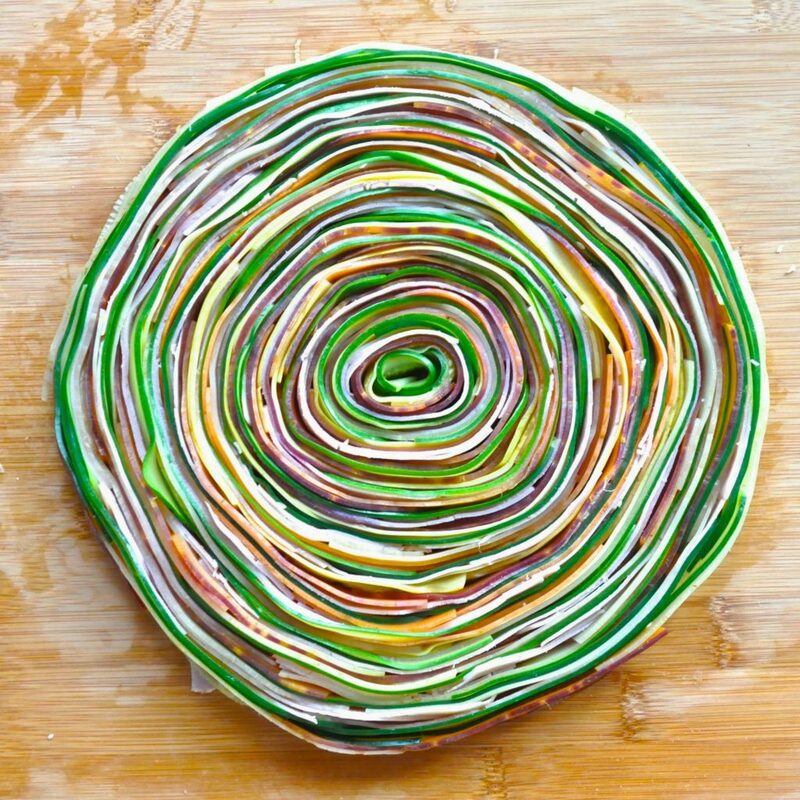 (But warning – it will undoubtedly be harder to transfer the spiral to the tart shell.) 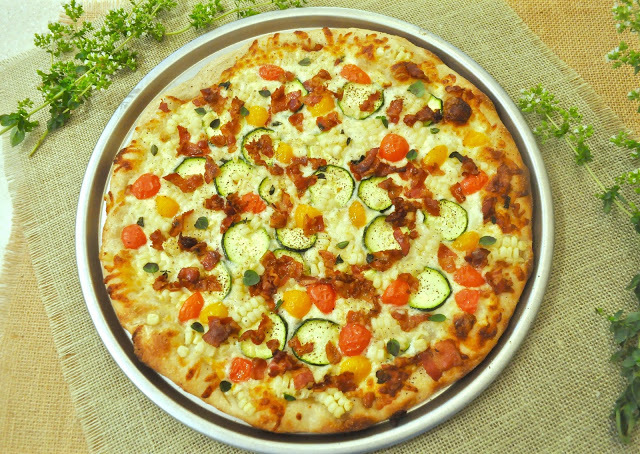 Now, you’re practically home free – just bake in the oven. If you do, please write me and let me know how it worked out. If you’re still speaking to me. into strips with a vegetable peeler. prepare a large bowl of cold water. in cold water to stop cooking, drain well and dry with paper towels. zucchini in length. The slices should overlap slightly in length. You’ll get a long strip of zucchini. the same way and with the carrot. 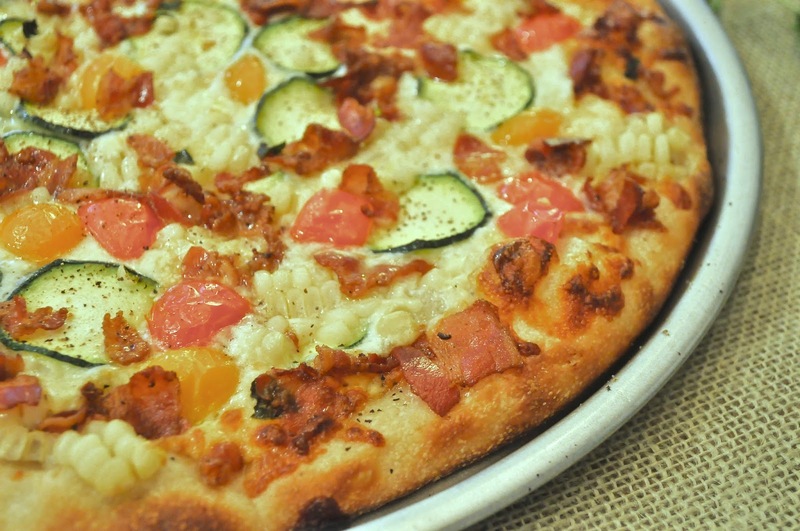 zucchini, carrot and ham this time. then you should get the same as the first picture. pan and let the precooked for 10 minutes at 180°C/350°F (HA! good luck with that). little. It should look like the second picture. Bake for thirty minutes at 180°C/350°F. For the pastry, put everything except the cold water into a food processor. Pulse until it is the consistency of damp sand. Add the cold water and pulse a few more times, until the dough sticks together. Roll into a disk and wrap in plastic wrap. 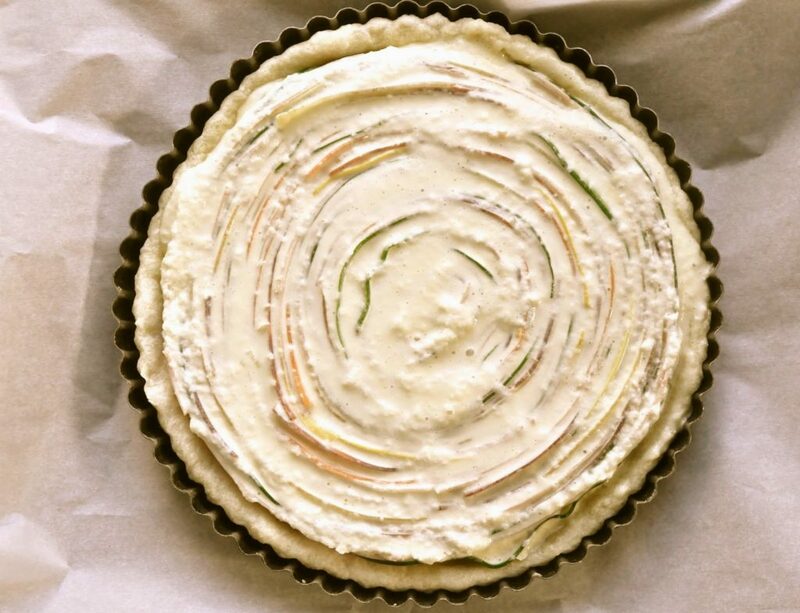 Let it rest in refrigerator a little (if you have time and patience, even a half-hour rest helps), then roll it out on a floured board and fit into a tart pan. Prick the bottom and sides of the pan with a fork. 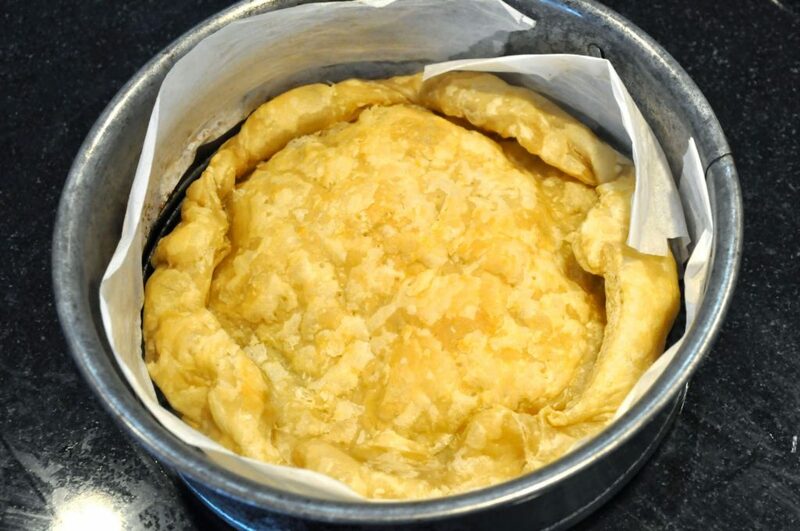 Refrigerate the tart pan for an hour, then bake at 350 degrees for about 20 minutes. For those of you with gardens, your zucchini is coming in fast and furious right now, I’m sure. If you haven’t got a garden, they’re plentiful in farmer’s markets too. 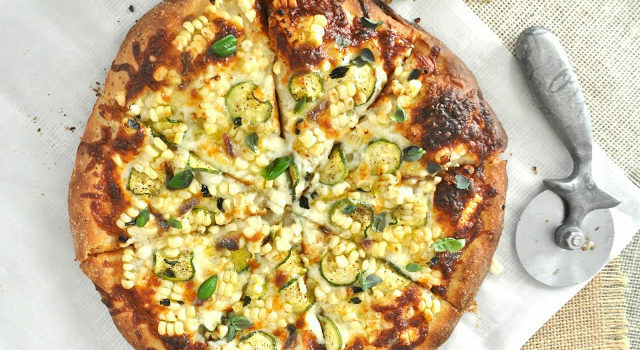 How to use all those zucchini? 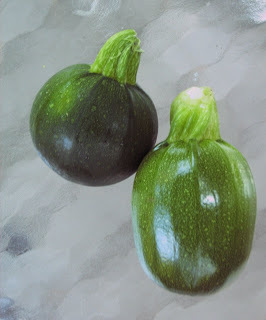 I’ve posted lots of recipes on the blog, from stuffed zucchini to raw zucchini salad to chocolate zucchini cake. 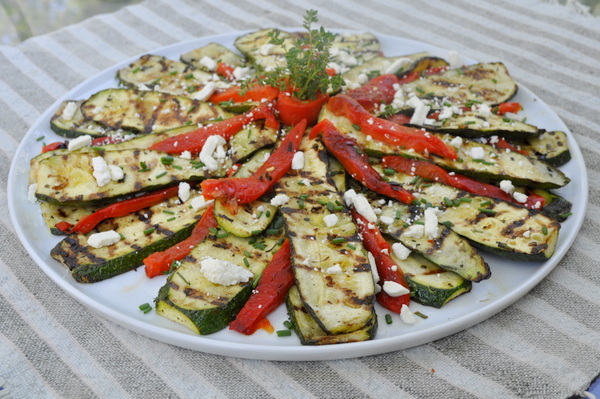 But grilled veggies are great for summertime, especially if you’re having guests. 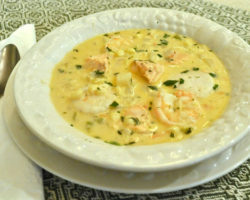 You can make this ahead of time and serve it at room temperature. And sometimes you want something different from the ubiquitous potato salad and oil-and-vinegar-based side dishes. That’s where grilled veggies come in. My favorite is zucchini, because they don’t soak up as much oil as eggplants. 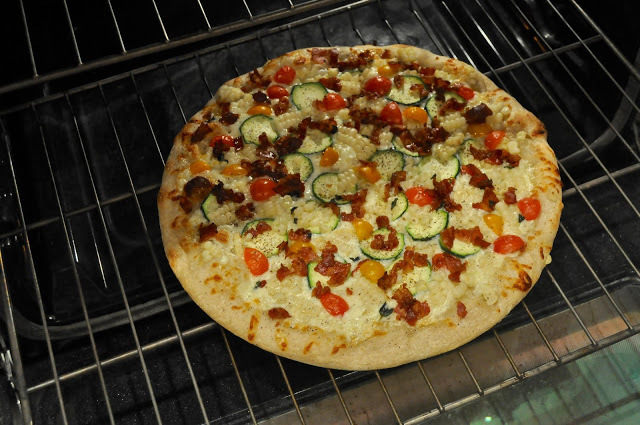 Here I’ve combined the zucchini with roasted peppers (instructions here), and a sprinkling of feta cheese. 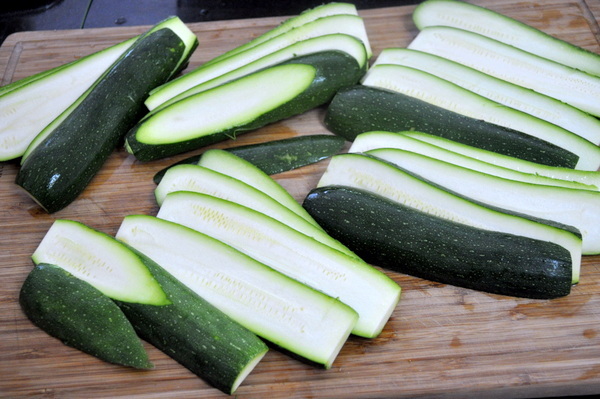 Start with slicing the zucchini rather thick – about 1/4 inch. 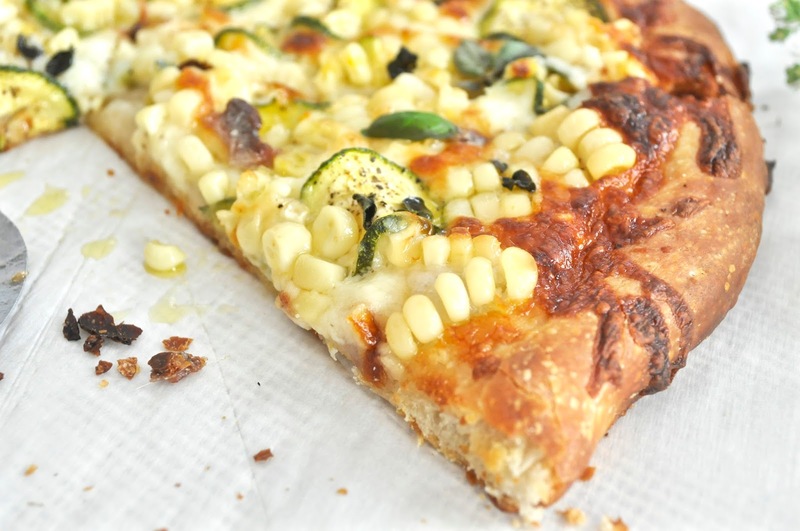 If the slices are too thin, they’ll scorch on the grill. 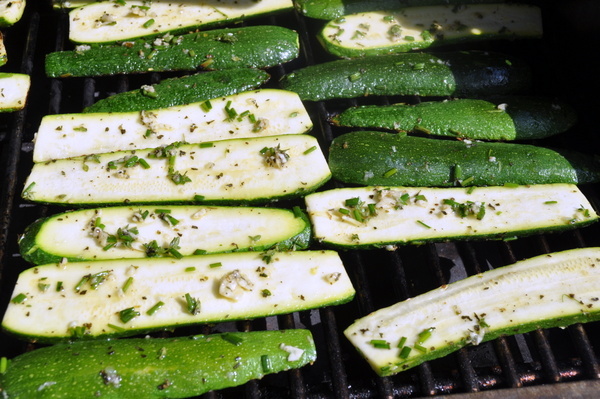 Thick slices gives the zucchini time to cook on the inside and develop nice grill marks too. I don’t have a picture for you, but I normally put the slices in a large bowl, season with minced garlic, salt, pepper and fresh herbs – here it’s chives and thyme. Pour some olive oil into the bowl, then mix everything together, using your hands. Place the slices on the grill (don’t stray far, they’ll cook fast) and turn them once, until they’re browned on each side. 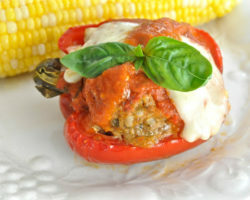 Serve them alone, or with roasted peppers, more fresh herbs and a scattering of feta cheese. 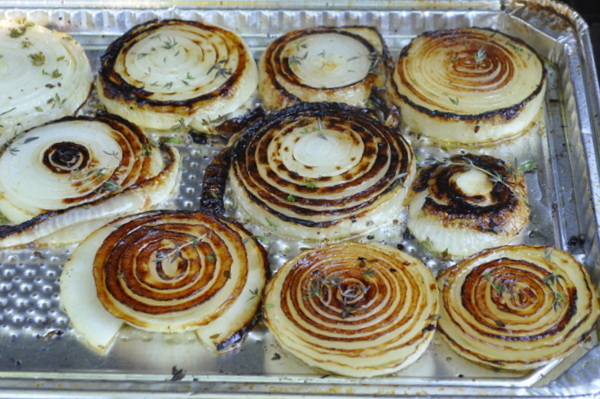 Onions are great on the grill too, but to avoid having the rings fall through the grates, I use an aluminum foil pan. Run a little olive oil on each side, then season the same way – salt, pepper and fresh herbs. These take a little longer to brown, but it’s worth the wait for that caramelized goodness. I use the same technique for grilled tomatoes. If you have leftovers, so much the better. 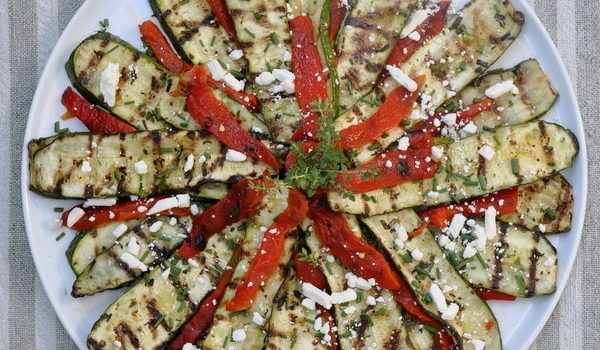 Grilled veggies are delicious in a sandwich, as a topping for pizza, or added to pasta or rice. 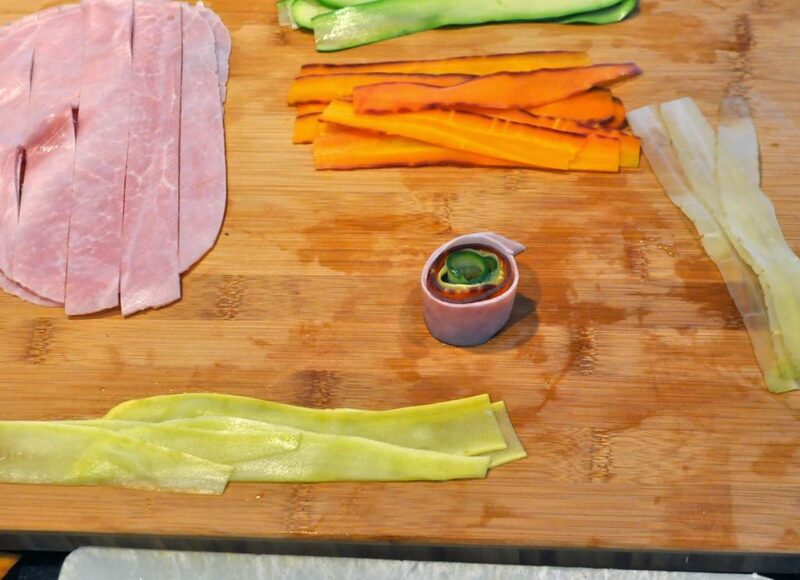 Slice the vegetables on the thick side (about 1/4 inch). 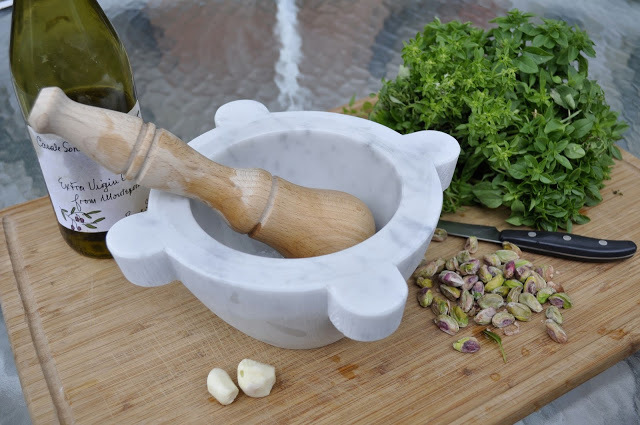 Place in a bowl (not the onions or tomatoes – put them on an aluminum pan and season with the oil, garlic and herbs) Pour some olive oil over the vegetables to coat them, season with the garlic, herbs, salt and pepper. Place on a hot grill and turn once, after the first side has developed nice grill marks. Flip and do the same on the other side. Anyone who’s ever eaten or made ratatouille has an opinion on what the dish should taste like and how it should be prepared. Let me just say there is no definitive version. There’s only the version you like. The version I like? It spoke to me at a Provencal restaurant along the Mediterranean Sea nearly 25 years ago. “Use more olive oil,” it said. “Use more red peppers,” it said. So I listened. And I made it. But it wasn’t the same. So I made it again. And again. And again. 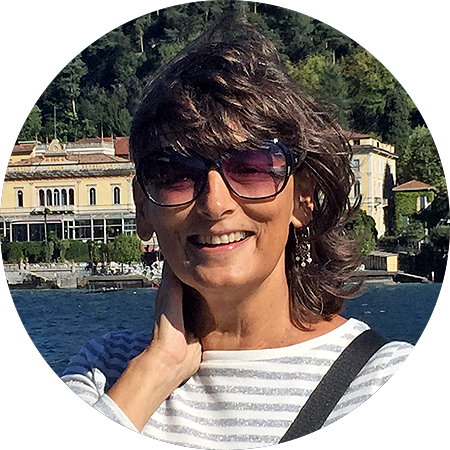 After years of trial and error, I finally figured out why I so loved that particular ratatouille in a little French village near the Italian border on that particular night. Yes, I liked the heavy hand the chef had taken with the olive oil, and yes I liked the abundance of red peppers. But it was technique as much as ingredients that made the dish special. The key to this particular recipe is layering. 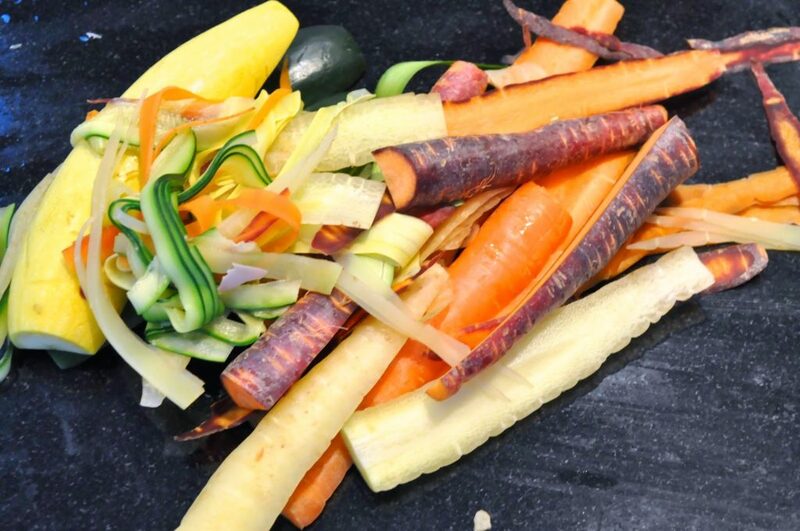 Don’t just throw all the vegetables into the pot and expect it to transport you to St. Tropez. Read the instructions and you’ll see what I mean. This makes a great side dish, particularly with sausages or pork as a main course. But it’s wonderful as a main course too, in individual casseroles topped with grated parmesan cheese and placed under the broiler for a few minutes. It’s the next best thing to being in Les Baux. Serves six as a side dish or four as a main course. 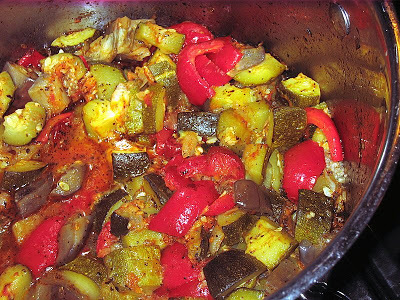 I prefer more red peppers (a lot more) and zucchini and fewer eggplants than most ratatouille recipes, but you can substitute anything you like. Saute the onions in part of the olive oil for about 10 minutes, or until translucent and golden. Remove the sauteed onions to a plate or bowl. Add more of the olive oil and the zucchini. Saute for five minutes or just until the pieces begin to soften. Remove and place on a separate plate. Add the peppers and saute for five minutes. Then add the onions and zucchini back into the pot with the peppers. Add the garlic and let it saute a few minutes. If using fresh tomatoes, peel the skin ahead of time by placing in a pot of boiling water for a few minutes, then cut in half, clean out the seeds and dice the flesh. Add the tomatoes to the pot. If using canned tomatoes, do not use the liquid in the can at first. You can add it later if the mixture looks too dry. Add the salt, pepper and herbs de provence and simmer at medium heat for 20 minutes with the lid off, to help evaporate some of the liquid. 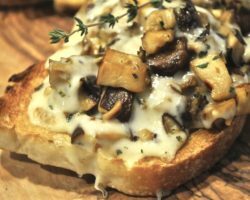 With this recipe, I didn’t start out on the right foot, or shall I say, finger. I bought a mandoline two months ago and the box was still unopened. I’ll bet you already know where this is going. The zucchini plants in the garden were still producing glossy green spheres, so I thought I’d inaugurate the contraption with them. It was time to open the box and get started. Unfortunately, my thumb and a slice of flesh got in the way. Six Band-Aids, two pints of blood (ok, so I exaggerate a little) and a half hour later, I tried again — this time using the protective thingamajig that comes with the mandoline. Although it’s the beginning of September and the weather should be starting to cool off, we had a nearly 90 degree day here in New Jersey — hot enough so that a cold salad seemed like just the ticket to accompany the grilled steak I was planning for dinner. 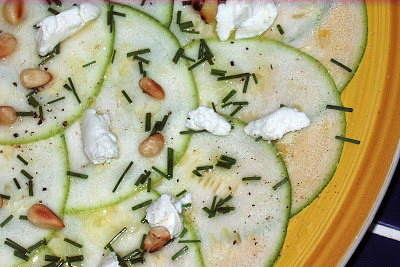 I pulled out the mandoline –not essential for this salad, but it does slice the zucchini paper-thin. In the photo, you can see how nearly-transparent the slices are. It’s hard, but not impossible, to get them as thin if you are slicing by hand. Just make sure you’re slicing by hand, not slicing a hand, like I did. I used one large round zucchini, but you can make this recipe with the long ones as well. 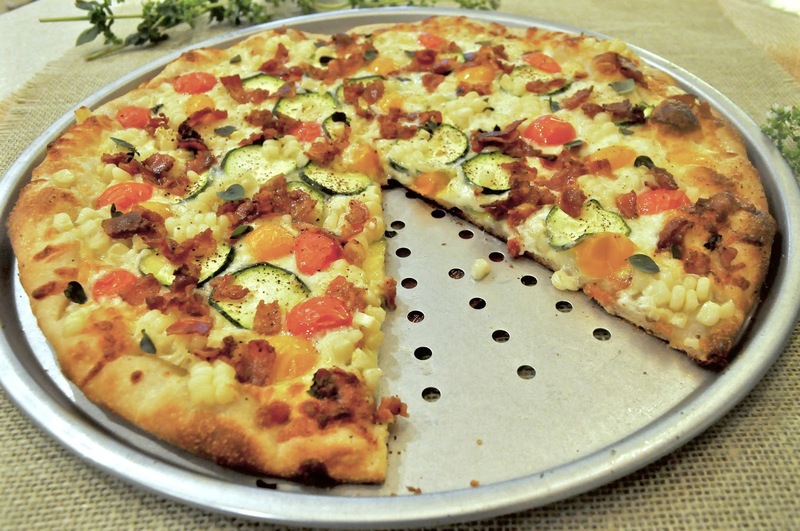 One large zucchini generously serves two people. This isn’t a true carpaccio like beef carpaccio, the thinly sliced raw delicacy, which by the way, was named after Vittore Carpaccio, a Renaissance artist who used lots of brilliant red in his paintings. But when your mandoline demands a pound of flesh from you, I think you can take liberties with the name. Besides, I used my share of brilliant red too. That is, if you’re counting hemoglobin. 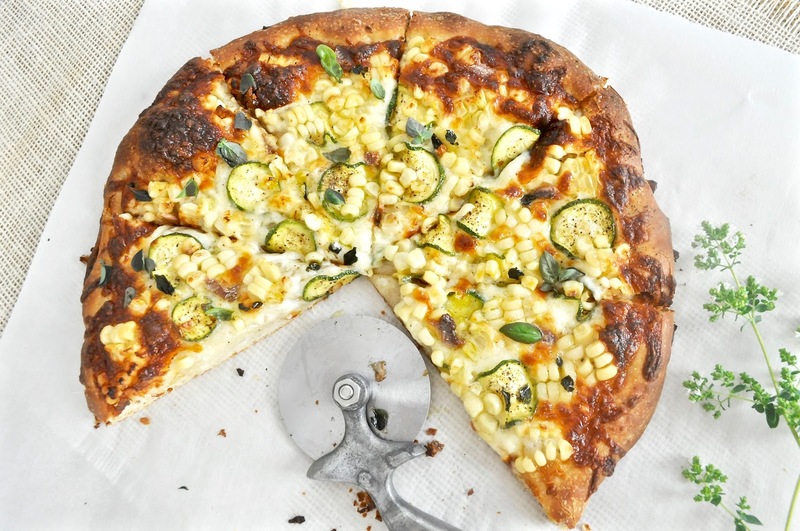 Slice zucchini and assemble on plate. Grind salt and pepper on zucchini slices. Sprinkle with chives, crumbled goat cheese and pine nuts. Whisk olive oil and vinegar together and drizzle on top. 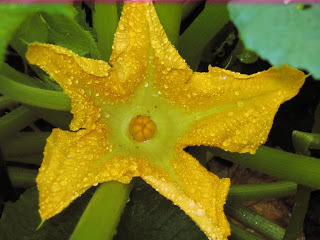 I know I just posted a zucchini recipe, but the season is almost gone for these fragile, delicate-tasting blossoms, so you’ve got to move fast if you want to try them this year. 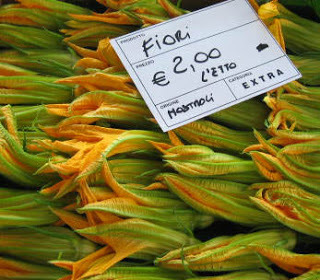 When we lived in Italy, we saw them at markets everywhere, but they’re not so easy to find in U.S. stores. Farmers’ markets are your best bets, unless you’ve got your own garden. And if you don’t have a vegetable plot, once you’ve tasted these, you’ll want to start digging – or make friends with someone who does have a garden. 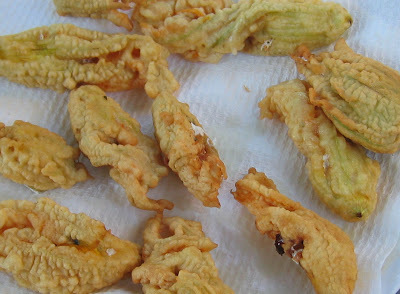 My favorite way to eat these beauties is to stuff them with mozzarella cheese and a sliver of an anchovy, then dip into a batter and deep fry. They are wickedly good prepared this way, but I limit myself to this indulgence only once a year, since they’re also wickedly caloric too. 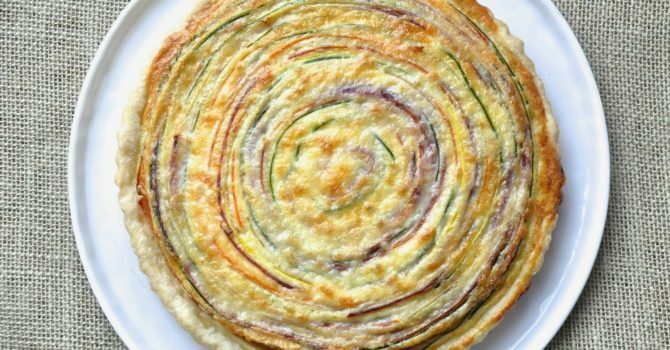 If you find yourself with an abundance of blossoms and don’t want to go the deep-frying route, you can slice them into thin strips and add them to omelets, frittatas, even a risotto. For each of these recipes, soak the zucchini blossoms in water to get rid of any garden pests that might be lurking in the crevices. On the other hand, if you miss one here or there, a little more protein won’t be so bad. Lift the blossoms from the water carefully, then dry on a paper towel. Carefully spread open the petals and with a flick of a finger, remove the pistol inside. Slice the mozzarella into sticks and gently insert one piece of cheese and one small sliver of anchovy into the flower (you can omit the anchovy but it does add a nice zing). Dip into batter and deep fry in hot oil. 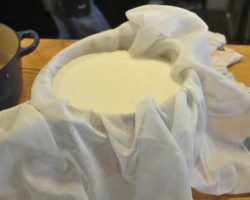 Mix the cheeses, then very gently, using a demitasse or small teaspoon, insert a portion of the filling into the flower. If you are adept at using a piping bag, use that instead of a spoon, since the flowers tear easily. But even if they do rip a little, don’t worry since the batter will coat them sufficiently to hide any rips. Dip into batter and fry in hot oil. Just mix enough flour (one cup is plenty for a dozen blossoms) and enough sparkling water until you get a mixture that’s the consistency of pancake batter. It’s best to let it sit at least 15 minutes to help make it smoother. Dip the flowers into the batter, and deep fry in hot oil. I use a cast-iron skillet and fill it about 1/2 full with canola oil. I also use the burner on my outdoor gas grill, which helps to keep the kitchen spatter-free. 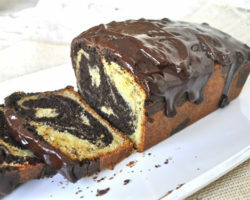 Drain on paper towels and eat immediately. 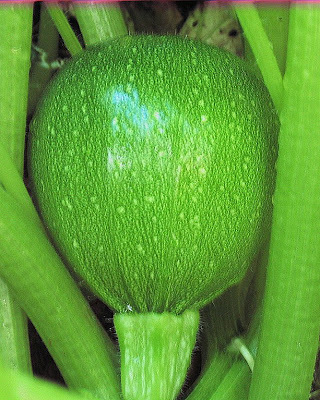 happen to zucchini when you turn your back on them for even one day. One day the vegetables are little baby orbs at the end of a stem. But in the dark of the night when you’re not watching, they mainstream steroids, and morph into something nearing the size of a baseball bat. 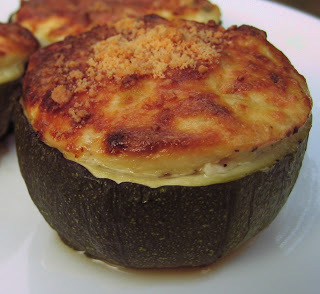 So for all of you with an abundance of zucchini, here’s another way to use those babies. Just check your garden regularly though, and pick your zucchini before they’re large enough to hit second base. In this recipe, I use the round variety, but you can use the long ones equally as well. 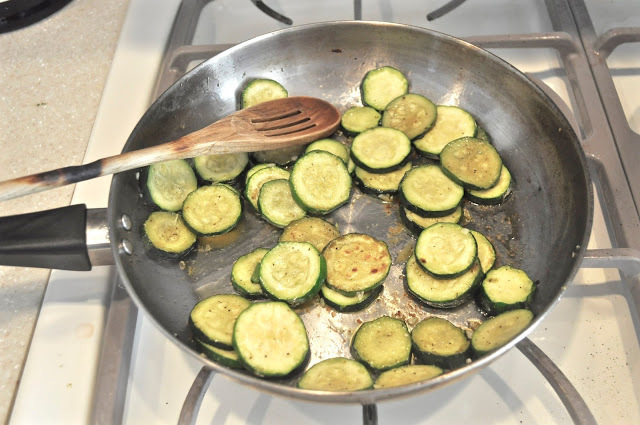 Trim the stem off the zucchini, and place in boiling water for about 5 minutes. Cool, then cut in half and scoop out interior of zucchini. Salt and pepper the hollowed out zucchini. Chop the part you scoop out and saute at high heat, along with the onion, in olive oil, until most of the water has evaporated from the zucchini. In a bowl, place ricotta, eggs, parmesan cheese, salt, pepper and herbs. Add the sauteed, chopped zucchini and onion to the ricotta mix and stir. 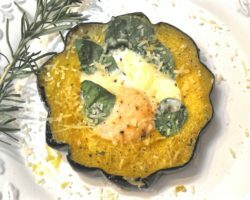 Place some of the filling inside each of the hollowed-out zucchini, sprinkle more parmesan cheese on top, and bake at 425 degrees for about 30-40 minutes.